Master of horror John Carpenter (Halloween, The Thing) directs this terrifying battle between humankind and ultimate evil. A highly underrated film in John Carpenter’s film catalog, Prince of Darkness brings together a great cast with a chilling story. John considers this movie to be the second film in what calls his “Apocalypse Trilogy” (with the others two being The Thing and In The Mouth of Madness). Know for bringing back talent from previous films, Donald Pleasence (Halloween), Victor Wong and Dennis Dun’s (Big Trouble in Little China) roles were written specifically for them by John Carpenter. 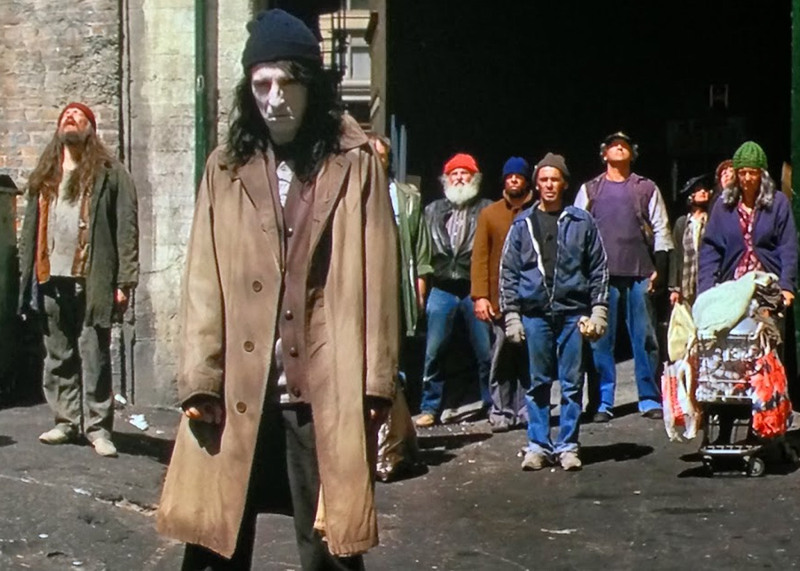 With the addition of Alice Cooper as the leader of the homeless people outside of the church, the film offers a disturbing look at what “Evil” is and what shape it can take. The camera work, lighting and locations — along with some chilling FX work and a musical score that finds ways to crawl along your spine — help to make the story more believable and create an atmosphere I don’t think John has achieved since Halloween. A priest lays on his death bed clutching a ornate silver box, his hands dropping from it as he dies. A Nun finds his body the next day and contacts Father Loomis. He starts to read through the dead priest’s journals and finds disturbing information. We later see Father Loomis discussing the matter of the box with other members of the church and opens the box to discover a key. We now see Professor Howard Birack giving a lecture on logic and reality at a university to his students, all while Loomis goes to an old church and finds the door that the key opens. Upon exploring, he finds a giant container with a spinning green fluid contained in it. Later, a Nun shows up and hands a sealed letter to the professor. 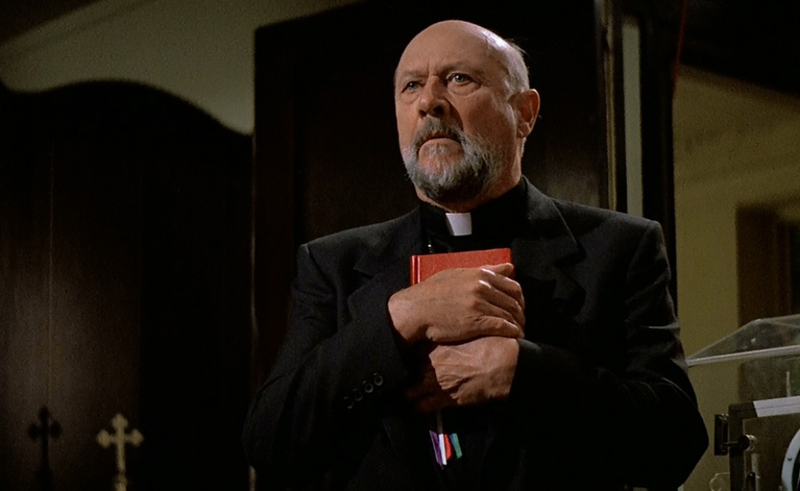 He later meets with Loomis, and he shares the diary of the dead priest with him. 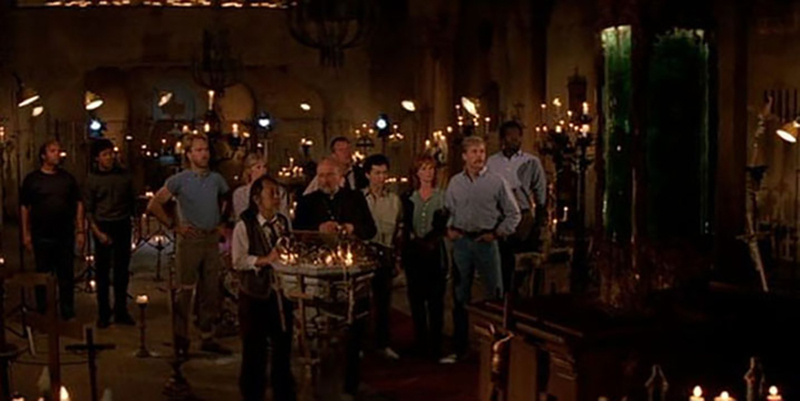 They go to visit the old church with container in it, and after seeing it, the professor decides to bring in his class to research what the container holds and to translate an ancient text that is found along with it. Half of the class is upset about having to give up their weekend, but after being told they will be given extra credit for the work, everyone shows up at the church, and they begin to set up all of their equipment. Two of the students, Brian and Catherine, strike up conversation and then later a sexual relationship heading into the weekend. As everyone arrives, we start to notice a “gang” of homeless people outside of the church, watching the students and what they are doing. After the group sets up all of their equipment and told the theory that what they are observing and testing could be the essence of pure evil, skepticism runs abound until odd things start happening. Insects, worms and strange bruising start to occur, and then members of the crew are killed off one by one by the homeless people or possessed by the strange green fluid in the container. As they desperately try to figure out what is going on, the group is trapped in the building by the homeless mob outside, all while being terrorized inside by their possessed classmates. Those that fall asleep are all afflicted by a strange dream that seems like a TV transmission, a premonition of what is to happen. One of the female students, Kelly, is possessed and her body begins to go through a grotesque transformation as she becomes the host to something even more insidious than the others. As a last stand, they barricade themselves into a room to try and fend off the looming evil. Kelly awakens as a transformed conduit of the evil and attempts to bring the Devil over from the other side of reality to end mankind for all time. Can the group save themselves from becoming part of the Devil’s plan or will evil walk the earth eternally? You are going to have to watch to find out. Alternate Opening from TV Version- (run time of 7 minutes) The opening credits are much faster and it suggests that the events of the the film could be part of a dream that the Character of Brian Marsh is experiencing. Easter Egg- (Run time of 12 minutes) If you highlight the tombstone on the second menu of the special features, you can view footage of the 25th anniversary screening of the film at Screamfest 2012 with a John Carpenter Q and A.
Shout!/Scream Factory once again brings us a John Carpenter genre classic to Blu-Ray DVD! With an amazing digital and sound transfer, Prince of Darkness may be the best Carpenter title brought to Blu-Ray yet! The film far surpasses the 1998 Image Entertainment and the 2003 Universal Studio’s release in 2002 in all departments, including special features. The new commentary Writer/Director John Carpenter is fantastic, as is his interview segment. 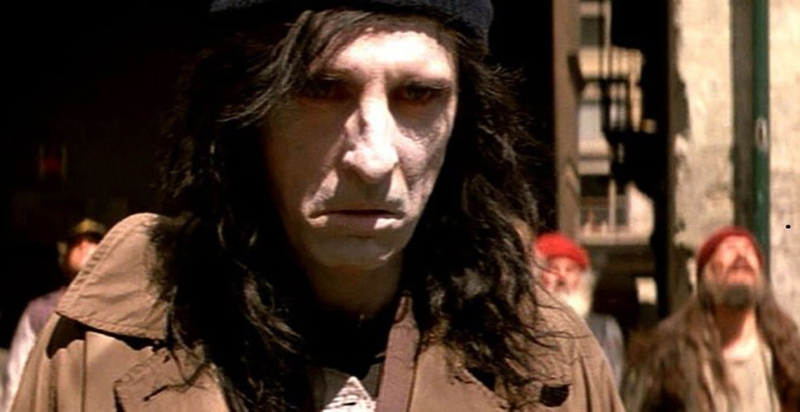 The Horror’s Hallowed Ground segment was highly entertaining and informative as usual, but I feel the real prize of this Prince of Darkness Blu-Ray is the Alice Cooper interview. 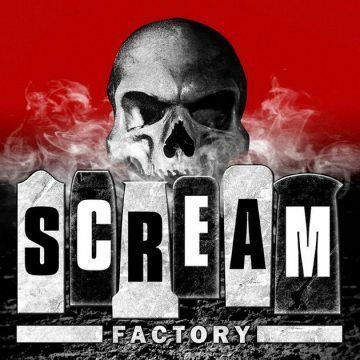 With a mix of new interviews, the alternate opening, the Easter Egg of the John Carpenter Q and A at Screamfest 2012 and a host of other features (including the Theatrical Trailer, Radio Spots and Still Gallery), Shout!/Scream Factory is once again showing why it is the standard bearer for Blu-Ray horror releases!